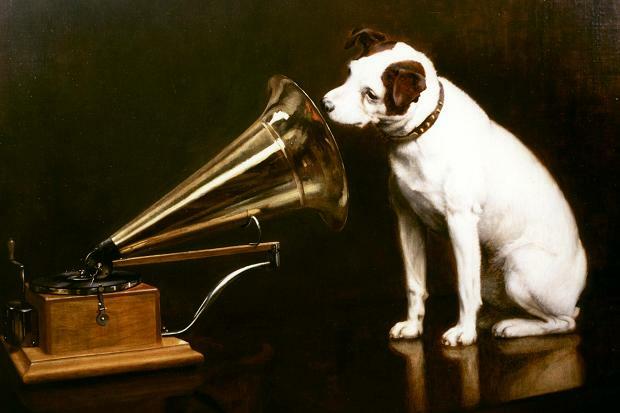 (Not) Her Master’s Voice – Super Bon! Roughly two weeks ago, Wolfgang Ernst came to Montreal. I missed both talks, as I was at the University of Michigan. * But we did meet up on Saturday for a visit to the Musée des ondes Emile Berliner, whose back areas are filled with old media technologies, as well as many versions of the His Master’s Voice logo, ranging from pictures to larger-than-life models. Francis Barraud’s painting has captured the imaginations of media theorists and historians like Amy Lawrence, Michael Taussig, Friedrich Kittler, and of course Wolfgang and me. Later in evening, Wolfgang wondered aloud whether a dog would actually listen to a recording in this way. I wondered back what would happen with cats. He laughed and said a cat is something completely different. The following Tuesday morning I got my answer. As part of an assignment for my graduate seminar this term, I asked students to make a 1-minute remix of Hildegard Westerkamp’s Kits Beach Soundwalk. ** The goal was simply to get them comfortable with audio editing and not to worry too much about the final product. But of course some students have lots of audio experience (probably more than me!) and they got creative with the assignment. The following video happened when I put on Eric Powell’s contribution. My kitten, Galaxie, jumped up on the desk and started sniffing the speaker frantically. Recalling my conversation with Wolfgang, I ran into the next room, grabbed my phone and started filming. By this time, she was on the other speaker. She listens in a state of distraction, but finally loses interest when she hears her sister playing in the litter box a room away. If Barraud’s painting is an allegory for the mimetic promise of sound recording at the moment of its historical emergence, my collaboration with Galaxie is an allegory for modern, distracted conditions of listening. * In some kind of recursive loop someone asked me in my Michigan Q&A what I thought of Wolfgang’s work (specifically his approach to sound and materiality), probably right as he was giving a talk on sonicity at Concordia. The short answer: Ernst is usually understood as a materialist but he is at least as much a romantic. ** I had assigned it as an example of “critical media practice” or “DH multimodal scholarship” avant la lettre.